The director of the British Museum, Mr Hartwig Fischer, recently defended the historical theft of the Parthenon Marbles dubbing their removal a “creative act”. His comments again reinstated that they are the legal owners and have null intentions of returning or even loaning them to Greece. A stance far from new, his statement has enraged many advocates for the repatriation of the Marbles around the world. "We’ve actually been saying this for quite a long time, that the British museum and the previous directors have always maintained this position. Whereas some people in this advocacy around the world are very hopeful that cultural diplomacy and conversations and using nice words and being positive that eventually we’re going to have a dialogue. It will never go anywhere like this. UNESCO made an approach to the British Museum to come to the table under the auspices of the highest cultural organisation, abattoir in the world arbitrary in the world, with the Parthenon as its logo ad-hoc with UNESCO and the British Museum still refused. They never intended to discuss this matter with Greece." "There are a lot of well-meaning people in the lobby of support around the world that believe that cultural diplomacy is the solution. But they’re hopeful that engaging in discussion and hearing arrangements and finding solutions are going to be fruitful but they constantly prove that they have not changed their position. They are firm in their stance that they will keep them, they say that they own them, that they have clear legal title and they don’t. We have to find another way to demonstrate that. Greece needs to get better at articulating the arguments on the international stage. Get other foreign ministers, lobby harder at state level. That’s what the British Museum does, it downgrades the issue to museum and culture ministry heads. We need to be more strategic in our tactics." "The fact that they claim they have clear legal title, that’s the first fallacy. The second is that they keep perpetuating is that they’ve rescued them [the Marbles] in a way – a lie- and the other half is that Elgin didn’t hack off the buildings. They keep repeating their position that the British Museum is a safe space where international cultural treasures are being showcased for everyone to see, but they haven’t even taken proper care of them. They actually damaged them in the 30s and the 40s, they cleaned them with hard brushes, and they bleached them. They’ve been damaged in the museum; they’d been displayed in a terrible gallery. The artwork was one whole; the Parthenon, tells one story of Athens; it was one narrative that’s been dismembered. Imagine the Mona Lisa or Michelangelo’s David being chopped in half. It’s unimaginable." Melbourne barrister Jim Mellas staged a silent protest at the British Museum; his video went viral, and since he has created a community of over 12,000 members requesting to ‘Reunite the Parthenon’. Following up on Mr Fischer’s interview he too had certain points to make. "I disagree with his argument that the British Museum is showing the Parthenon Sculptures in a context of world cultures. The universal museum argument has been discredited over a number of years. 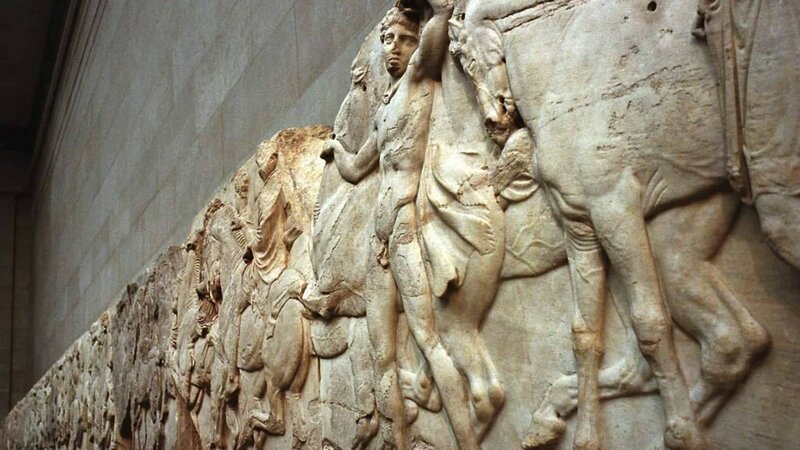 The Parthenon frieze was approximately 250 feet long and depicted wars and life in ancient Athens. The Parthenon Marbles do not belong in the British Museum they belong to themselves and need to be reunified at the Acropolis Museum where the other half of the Marbles are held and exhibited within sight of the Parthenon from which they were taken." "As the Director of the Museum he and the Trustees do have an obligation to preserve the collection in its entirety, so that things that are part of this collection remain part of this collection. It is correct that the the British Parliament though an Act of Parliament transferred the responsibility for Parthenon Marbles as well as other collections to the Trustees of the British Museum. Therefore they have a fiduciary responsibility to preserve the collections for future generations. That is what I would expect the Director or any of the trustees to say. I would have been shocked if he had said otherwise." "The Parthenon is a structure that still exists and the other half of the Parthenon Marbles are in Athens and they can be reunified at the Acropolis Museum. This is the only way the story they tell can be understood and fully appreciated."